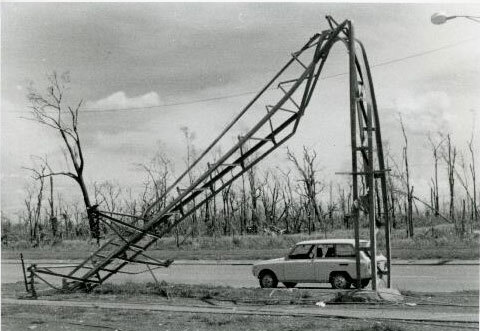 In December 1974, Cyclone Tracy devastated Darwin and completely annihilated the city’s electricity supply. Located on the shore, Stokes Hill power station was subjected to extremely high winds and drenched in salt water. 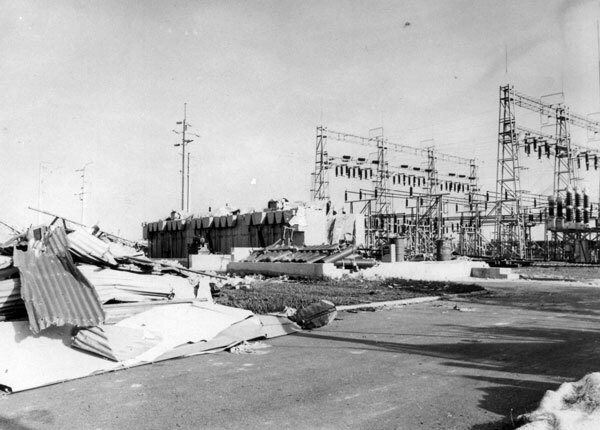 Although the power station sustained no significant plant damage, extensive damage to roofing and walls allowed water to flood the station and destroy electrical equipment. All substations were damaged by airborne debris. Casuarina zone substation collapsed completely, both switchgear and control panels being buried under the rubble. Overhead distribution systems were totally destroyed.